Visiting the tomb of elect souls, those who have attained the Nearness is a living source of blessings. In Sufi tradition particularly, the final resting place of the great masters and guides have always been frequented as a place of remembrance, veneration and holy benediction. There are many significant dimensions to such visits of tomb of saints; few being, it helps remember our own reality of leaving this transitional world, it deepens the quality of surrender and allows one to pray for those who have crossed this world. The elect friends of God are graced with extra-ordinary way of communicating even from behind the veil of their disappearance. The true words of Rumi carry the ability to stamp profound effects on the heart of many, even after so many hundreds of years. Rumi is one of the most read poet of our time, even though his worldly pen stopped about eight hundred years ago. But everyday his poems continue to open many hearts towards divine love. Infact for many who came to spiritual journey, came through Rumi's words. 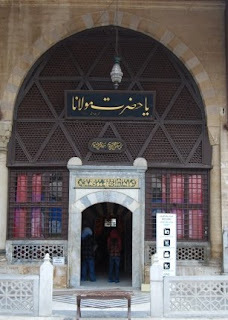 The visit to the tomb of Mevlana Rumi in Konya, Turkey has a special place. There are many who have extra-ordinary awakening, dreams, visions and guidance before, during and after their visit to the perfumed tomb of this great friend of God. I personally have heard also from people who made such pilgrimage of the other-worldly experiences they were given out of the visit. "I had always wanted to visit Konya, just so I could visit the blessed tomb of Mevlana Jalāl ad-Dīn Rumi, one of the greatest mystical poets of all times. I had been to Istanbul a couple of times before, but for one reason or another, I never got the chance to visit Konya; however this time, I was determined to make that extra journey and go spend a day in Konya. So, on the 28th December 2009, I got a flight from Istanbul to Konya. I had no knowledge of what Konya was like, nor did I bother to read up about the city, and to be very honest, I didn’t really care because my prime aim and purpose of the trip was just to visit the blessed tomb of Mevlana. I arrived at Konya airport at 8am, and my tour guide was waiting outside for me. We headed straight to Mevlana’s Mausoleum first. Whilst driving up to the Mausoleum, I sensed a completely different atmosphere; the roads were empty and quiet, hardly could see people out and about, there were not that many mosques in sight, everything seemed a bit dull to me, it was totally different to Istanbul! The weather that day was cold and cloudy, which didn’t exactly uplift my mood, but then my gaze fell upon the beautiful green minaret of Mevlana’s mosque.."
This is the main entrance of the Mausoleum, inside here are the tombs of Rumi’s family and descendants. The headstones for the male graves have either a green or white turban; the green represents the fact that the person is from the family of Prophet Muhammad salla’Allahu ‘alayhi wasalam, and the white represents that the person is just a descendant of Mevlana. The female graves obviously have no turbans on them, so you could easily identify them. At the corner, right beneath the green minaret, is the tomb of Mevlana Rumi. Unfortunately, they do not allow you to take pictures inside the Mausoleum, especially of the tombs, therefore I do not have any to share, but at that point, taking pictures was the last thing on my mind anyway because I was feeling a bit overwhelmed.. I stood there in awe, unable to hold back my tears, and still couldn’t believe I was standing at the grave of this great person who has moved, transformed, cured and healed many hearts and minds through his poetry, and guiding people to Divine Love. I first came across Mevlana Rumi about 5 years ago, when I didn’t really have any interest in poetry, or even Sufism at that point in my life! 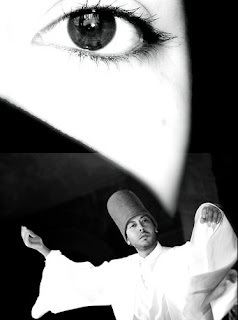 But something about Mevlana’s words had an impact on me, and I started reading more of his poems and quotes. I’ve often found great solace, and many answers to my problems/issues in his poetry and advice, therefore for me to visit his blessed grave was something very special and personal. I stood there giving salams on behalf of all those who had asked me to, and then made du’a (supplication). I cannot fully describe the feeling I got whilst standing there, one really has to visit and experience it themselves in order to understand. [>] To read the post in full and to view more photos at the Tomb in Konya, visit here.